Rita's Italian Ice franchise business opportunity. Free Rita's Italian Ice business franchise information. What began as a dessert, turned into a craze? 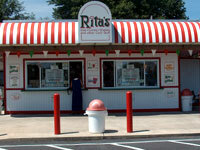 Get in line and see why everyone's hooked on Rita's, the largest Italian Ice chain in the world. For over 20 years, thousands of people have been streaming into our stores to get their "Rita's fix" of delicious treats made fresh daily. A whopping 54% of customers surveyed visit Rita's at least once a week! Our enormous popularity has helped fuel our growth to over 340 stores in 11 states. Now, we're on the march to bring Rita's to the millions of people who, until now, have been deprived of the sublime pleasures of our frozen treats! Our customers tell us that we make the world's best fresh fruit Italian Ices, Cream Ices, Old-fashioned Custard, Gelatis and Misto Shakes, which are made fresh every day. Now, we're making headlines by championing a low-cost, high-value product category that is about to explode. If that isn't enough to whet your appetite, consider this: some of our franchisees choose to work just 7 months a year and take the other 5 months off! Others can work year-round by opting for a mall or other retail location. Rita's is the perfect business opportunity for those looking to get out of the rat race, have fun and offer a product and service that always brings a smile. Rita's has developed and tested a proven system for our operators. And our track record dates back to 1984. 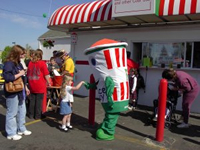 When you purchase a Rita's franchise, you benefit from our years of experience in the franchise industry. We're constantly refining our products and services, until it's as close to perfect as we can get. Our business system is comprehensive, encompassing everything from initial start-up to product ordering and prep, from administration to business management. Rita's was named one of the top 25 high performing franchises according to the Wall Street Journal and FRANdata. You'll visit our corporate headquarters in <?xml:namespace prefix = st1 ns = "urn:schemas-microsoft-com:office:smarttags" />Philadelphia, PA for a 6-day training period. You'll learn about our products and services, product preparation, store operations and policies and procedures. You'll get on-site field training as you open your new store. You'll have years of quick service restaurant and franchising experience behind you. Plus, our ongoing support is always just a phone call away. The old saying is true: location, location, location. We've developed a site criteria that identifies those areas with maximum consumer potential. But that still isn't enough. We've prepared a rigorous site selection criteria for you to use as you search for your location and negotiate your lease. We'll help with finding a contractor, store design and layout, zoning requirements, real estate agents and brokers. We also help by evaluating and approving your site. Our Franchise Service Department is made up of dedicated and experienced professionals working on your behalf. We will take the time necessary to help you operate successfully at peak efficiency. We'll help you maintain the high standards of quality and service that our loyal fans expect-and demand. We'll work with you on an ongoing basis to promote your store and duplicate the cult-like following we have with our customers. We'll help you with your Grand Opening, store marketing, advertising and promotions. Our corporate ad agency is there at the ready with system-wide programs and promotions, plus radio advertising. Tastes change and we have to be able to stay ahead of the game. Our R&D department is always whipping up new recipes and testing ideas for next year's menu. It's a tough job but somebody's got to do it! Investment range is $167,750 to $344,400 with minimum requirement of $75,000 in liquid assets and $250,000 net worth. Franchise fee is $30,000. To learn more about the Rita's Italian Ice franchise opportunity, simply complete the form below.